Fermacell has been a benchmark for quality dry lining building materials in the industry for over 40 years. In 2009, the product name was expanded to become the company name – Fermacell GmbH is the dry lining construction business unit of the Xella Group. The uniform product and company name supports the further internationalisation of the company. Fermacell has now become a firmly established name, even abroad. The Fermacell product range includes gypsum fiber board panels, dry flooring elements, the glass fibre-reinforced, cement-bonded Fermacell Powerpanel dry lining boards, the Fermacell greenline range and associated accessori. Fermacell is made from gypsum and recycled paper fibres. These two natural raw materials are mixed with water, without any other binders being added. The mixture is then pressed into stable boards under high pressure, dried, coated with a water repellent, and cut to the required sizes. The gypsum reacts with the water, penetrating and enveloping the fibres. This produces high stability and noncombustibility. Because of their material composition, fermacell boards are suitable for general construction, fire protection, and wet rooms. Fermacell is a Gypsum based fibre board, used primarily in high performance dry lining projects. 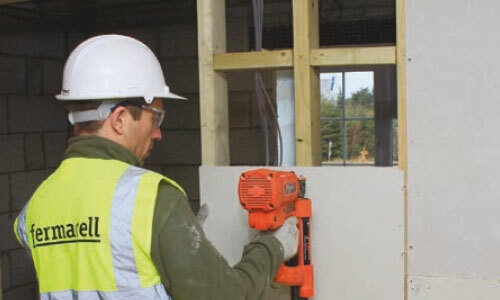 Manufactured in various locations from Europe and then distributed by Tennants throughout Ireland, Fermacell provide high quality, fully tested products to the construction Industry. So why do I need Fermacell? Well if you need racking strength, extra fire & moisture performance or improved sound reduction, then Fermacell is the board you need! It can be used as a straight forward building board, for fire protection of walls, floors, ceilings and steel beams, and also in high moisture content areas were plasterboard just won’t do, such as external walls or swimming pool areas. It can even bend round corners! Coming in many different board dimensions, thicknesses, density’s for a wide range of applications. So give Tennants trained staff a call to help you through the process of picking the perfect board for you.